I wanted to include a couple more vegetable/side/meatless dishes in the 68 Days of Gourmet project. 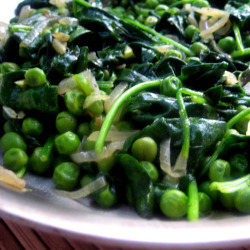 I flipped through The Gourmet Cookbook vegetable dishes and Peas with Spinach and Shallots looked like a great choice for Spring. It took less than 15 minutes to put together, was a nice change from plain peas or spinach and looked pretty on the plate. I find myself repeating the same sides over and over so it was good to try something new that was so easy and manageable on a weeknight! Heat a 12-inch nonstick skillet over medium heat. Add oil and butter and heat. Add shallots and garlic and cook, stirring frequently, until soft 3-6 minutes. 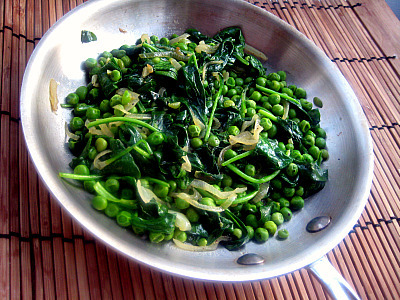 Stir in spinach, salt and pepper and cook, tossing, until spinach is just wilted, about 1 minute.